Name three different types of pathogens and briefly explain each. Explain the significance of John Snow’s research. Use the 5 W’s to create an organized outline of John Snow and what he contributed. Identify the core epidemiology functions and briefly describe them. What is the chain of infection? What are its parts? Briefly explain each. Explain case definition and why it is important for global health. What are the parts of the Epidemiologic triad and how does it help us understand infectious disease? List the key features and uses of descriptive epidemiology and analytic epidemiology. Describe the different modes of transmission of communicable disease in a population. Only answer ONE (1) of the following 3 questions. Dengue Fact Sheet What is dengue? Dengue is an acute infectious disease that comes in two forms: dengue and dengue hemorrhagic fever. The principal symptoms of dengue are high fever, severe headache, backache, joint pains, nausea and vomiting, eye pain, and rash. Generally, younger children have a milder illness than older children and adults. Dengue hemorrhagic fever is a more severe form of dengue. It is characterized by a fever that lasts from 2 to 7 days, with general signs and symptoms that could occur with many other illnesses (e.g., nausea, vomiting, abdominal pain, and headache). This stage is followed by hemorrhagic manifestations, tendency to bruise easily or other types of skin hemorrhages, bleeding nose or gums, and possibly internal bleeding. The smallest blood vessels (capillaries) become excessively permeable (“leaky”), allowing the fluid component to escape from the blood vessels. This may lead to failure of the circulatory system and shock, followed by death, if circulatory failure is not corrected. Although the average case-fatality rate is about 5%, with good medical management, mortality can be less than 1%. What causes dengue? Dengue and dengue hemorrhagic fever are caused by any one of four closely related flaviviruses, designated DEN-1, DEN–2, DEN-3, or DEN-4. How is dengue diagnosed? Diagnosis of dengue infection requires laboratory confirmation, either by isolating the virus from serum within 5 days after onset of symptoms, or by detecting convalescent-phase specific antibodies obtained at least 6 days after onset of symptoms. What is the treatment for dengue or dengue hemorrhagic fever? There is no specific medication for treatment of a dengue infection. Persons who think they have dengue should use analgesics (pain relievers) with acetaminophen and avoid those containing aspirin. They should also rest, drink plenty of fluids, and consult a physician. Persons with dengue hemorrhagic fever can be effectively treated by fluid replacement therapy if an early clinical diagnosis is made, but hospitalization is often required. How common is dengue and where is it found? Dengue is endemic in many tropical countries in Asia and Latin America, most countries in Africa, and much of the Caribbean, including Puerto Rico. Cases have occurred sporadically in Texas. Epidemics occur periodically. Globally, an estimated 50 to 100 million cases of dengue and several hundred thousand cases of dengue hemorrhagic fever occur each year, depending on epidemic activity. Between 100 and 200 suspected cases are introduced into the United States each year by travelers. How is dengue transmitted? Dengue is transmitted to people by the bite of an Aedes mosquito that is infected with a dengue virus. The mosquito becomes infected with dengue virus when it bites a person who has dengue or DHF and after about a week can transmit the virus while biting a healthy person. Monkeys may serve as a reservoir in some parts of Asia and Africa. Dengue cannot be spread directly from person to person. Who has an increased risk of being exposed to dengue? Susceptibility to dengue is universal. Residents of or visitors to tropical urban areas and other areas where dengue is endemic are at highest risk of becoming infected. While a person who survives a bout of dengue caused by one serotype develops lifelong immunity to that serotype, there is no cross-protection against the three other serotypes. What can be done to reduce the risk of acquiring dengue? There is no vaccine for preventing dengue. The best preventive measure for residents living in areas infested with Aedes aegypti is to eliminate the places where the mosquito lays her eggs, primarily artificial containers that hold water. Items that collect rainwater or are used to store water (for example, plastic containers, 55-gallon drums, buckets, or used automobile tires) should be covered or properly discarded. Pet and animal watering containers and vases with fresh flowers should be emptied and scoured at least once a week. This will eliminate the mosquito eggs and larvae and reduce the number of mosquitoes present in these areas. For travelers to areas with dengue, as well as people living in areas with dengue, the risk of being bitten by mosquitoes indoors is reduced by utilization of air conditioning or windows and doors that are screened. Proper application of mosquito repellents containing 20% to 30% DEET as the active ingredient on exposed skin and clothing decreases the risk of being bitten by mosquitoes. The risk of dengue infection for international travelers appears to be small, unless an epidemic is in progress. Can epidemics of dengue hemorrhagic fever be prevented? The emphasis for dengue prevention is on sustainable, community-based, integrated mosquito control, with limited reliance on insecticides (chemical larvicides and adulticides). Preventing epidemic disease requires a coordinated community effort to increase awareness about dengue/DHF, how to recognize it, and how to control the mosquito that transmits it. Residents are responsible for keeping their yards and patios free of sites where mosquitoes can be produced. Source: Centers for Disease Control and Prevention [Internet]. Dengue Fever. [updated 2005 Aug 22]. Available from http://www.cdc.gov/ncidod/dvbid/dengue/index.htm. 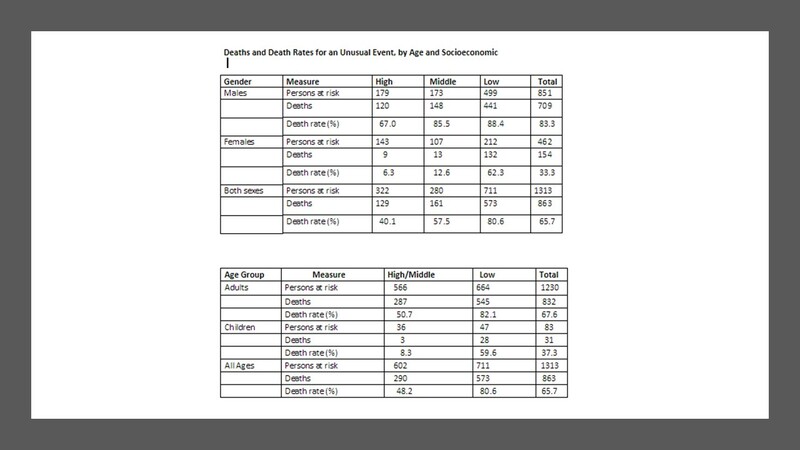 Using the data in Tables below describe the death rate patterns for the “Unusual Event.” For example, how do death rates vary between men and women overall, among the different socioeconomic classes, among men and women in different socioeconomic classes, and among adults and children in different socioeconomic classes? Can you guess what type of situation might result in such death rate patterns?